When lighting your landscape, it's important to consider the benefits of certain styles of lighting and the vast amount of lighting techniques available. 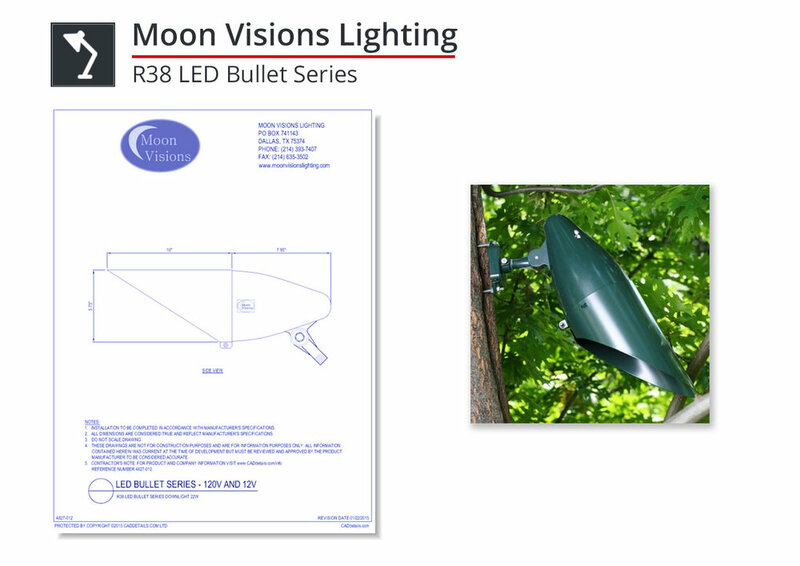 In a prior article, we discussed how to solve your biggest outdoor lighting problems, and today we wanted to offer a glimpse at some of the lighting solutions available. Suited for both commercial and residential projects, this rugged fixture is constructed of solid red brass offering superior strength and reliability. The adjustable shroud can be secured in place easily with the quick-lock set screw and silicone o-ring gaskets to ensure a weather-tight seal under harsh conditions. Jasper’s clear convex glass lens offers superior optics while protecting the lamp from moisture and debris. With an adjustable lamp base, Roxy offers a soft, dim light which accents walkways, plant beds, path borders and even stairs. Her clear glass lens protects the lamp and socket from water, moisture and debris. 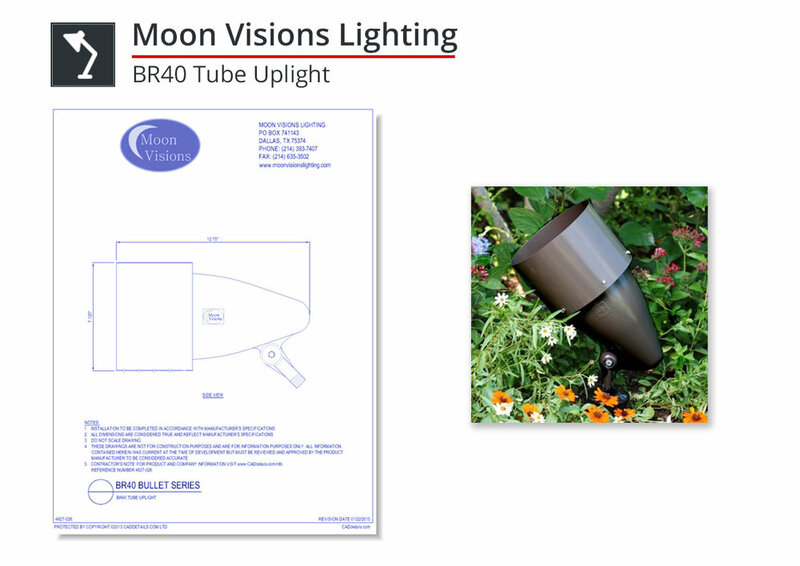 Placed at even intervals throughout your design, this weathered red brass pathlight will cast symmetrical light patterns on the ground, efficiently illuminating areas around landscape water features, including ponds or pools. For more subtle, soft deck lighting, Opal, our shielded deck light, gives you just the right amount of light to highlight your outdoor entertainment areas. Opal is the ideal niche light when adding interesting and artistic lighting in areas that require subtle, soft illumination. Installed on posts, beneath benches, against stair risers or as surface lights on vertical posts and below railings, Opal will help guests navigate paths, stairs, and other potential obstacles safely. 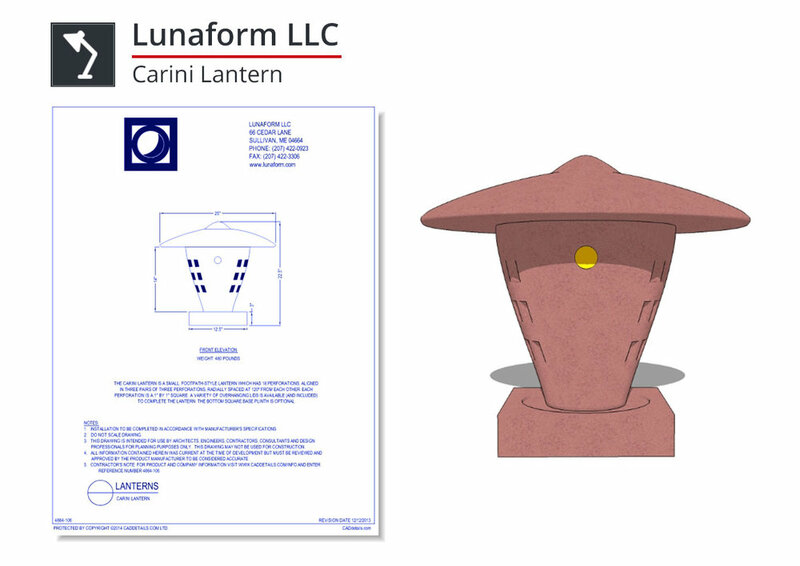 The Carini lantern is a small, footpath-style lantern which has 18 perforations, aligned in three pairs of three perforations, radially spaced at 120º from each other. Each perforation is a 1" by 1" square. A variety of overhanging lids is available (and included) to complete the lantern. The bottom square base plinth is optional. The LongHouse Lantern was made initially for Jack Lenor Larsen at The LongHouse Reserve in East Hampton, Long Island. This lantern has an upper, three sided lighting area for general area illumination, and a smaller light panel on the front side below for house numbers to be surface mounted and back-lit for easy reading. The Pico lantern is a slightly larger, footpath-style lantern than the Carini Lantern. It also has 18 perforations, aligned in three pairs of three perforations, radially spaced at 120º from each other. Each perforation is a 1" by 1" square. A variety of overhanging lids is available (and included) to complete the lantern. -Up and down tube shields available in all sizes – giving you maximum shielding capabilities! Cast Iron Poles and bases mated with fluted steel poles are featured here. These are municipal grade light poles meant for life in busy downtown environments. Cast Iron Lamp Posts have been popular for over 200 years beginning with the early colonial gas lamps. 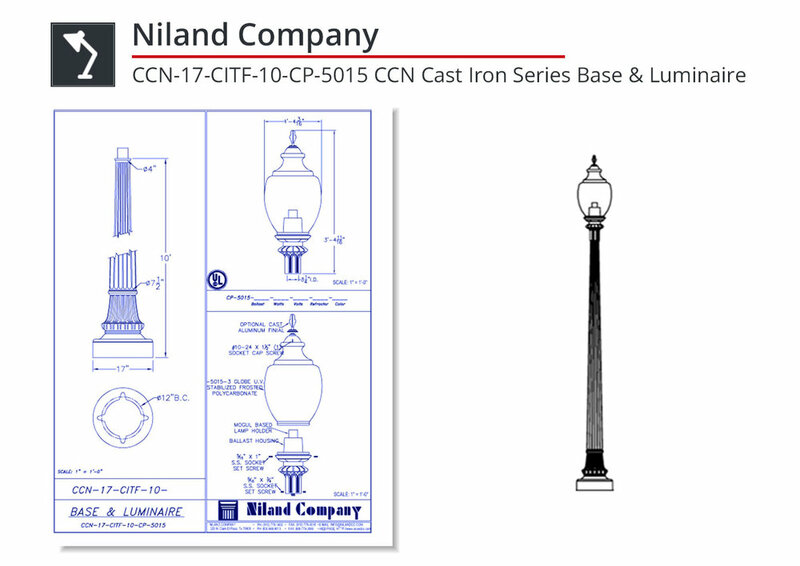 Niland is proud to continue this strong American tradition by offing the countries finest and most intricately cast iron poles in the industry. Fluted steel poles have given municipal and urban designers the flexibility of illuminating roadways with vintage poles up to 30 feet tall. Cast iron and steel antique street lights will finish any rough municipal environment with classic and durable style meant to last through the centuries. 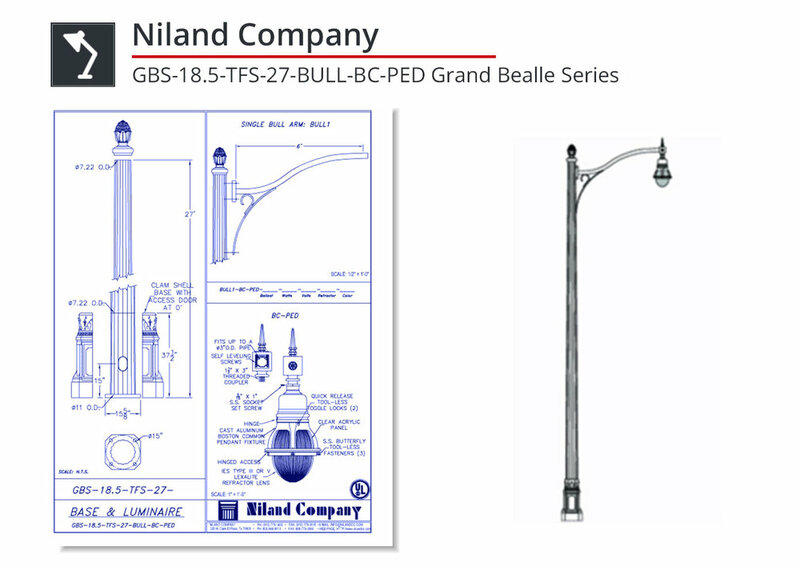 Niland manufactures the industries largest and most diverse offering of custom decorative aluminum pole products. 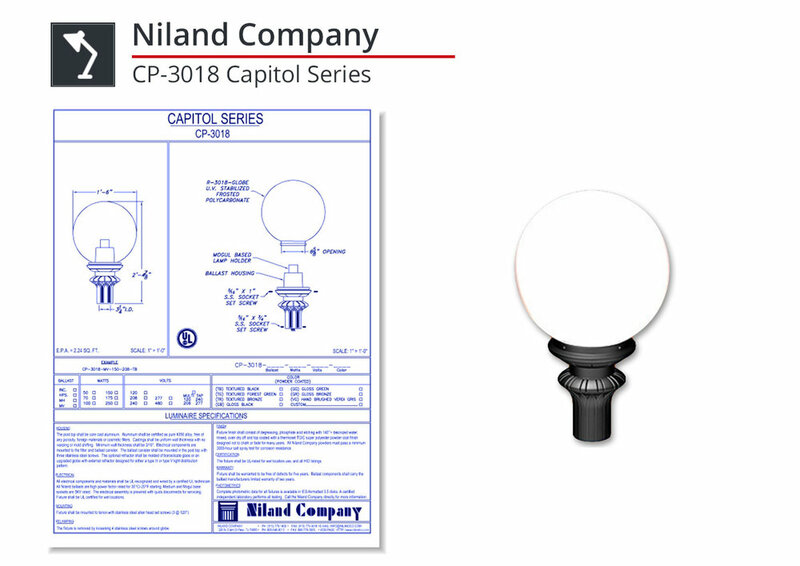 The Niland Company has developed the industries largest selection of completely customizable decorative outdoor lighting and site furnishing products. The products featured here on our website are easily specifiable with over 100,000 different and unique combinations allowing our core specifiers and agencies the ability to create a completely new and unique appearance to each and every development designed. 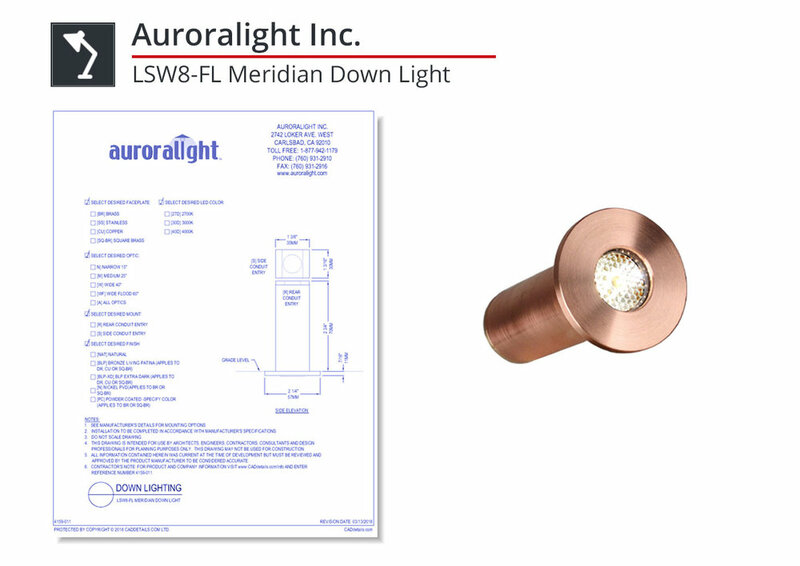 The Meridian LSW8-FL having a faceplate diameter of just 2 1/4" and a 1" aperture make it one of the smallest down lights available. 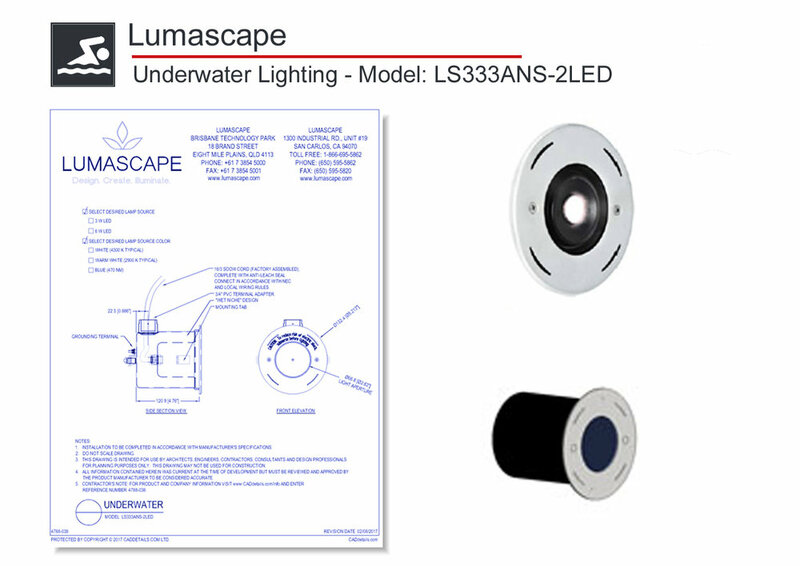 The LED package used in the LSW8 is the very latest technology delivering excellent performance and halogen like color temperature. Precise machining coupled with careful engineering addresses thermal management requirements and ensures high performance and reliability. The Meridian has an integral LED driver that allows it to operate on standard 12 volt systems with no additional hardware needed. The TELLURIDE HSL16 hybrid spotlight is an extraordinarily versatile lighting tool. Powered by cutting-edge CREE™ XP-L LEDs and crafted from solid copper and brass, this compact fixture delivers impressive lumen output and handles punishing environmental conditions in stride. The LSL4 is an ultra high performance LED spotlight delivering an unprecedented level of warm white light never before available in a 12 volt fixture! The entire machined brass body of the LSL4 is designed to provide an ideal heat sink for the 20w LED array with all critical components sealed into a field serviceable module. Featuring fully dimmable drive circuitry, interchangeable optics and over 12 mounting solutions; this powerful lighting tool is easily tamed to meet your specific needs. The LSL4 incorporates the latest in Auroralight engineering such as "3p" aiming offering over 900 degrees of adjustability on 3 separate planes, making this giant quite nimble. Looking for even more CAD files? Download our QuickPack.